Teofimo Lopez obliterates Mason Menard in 44 seconds with “Knockout of the Year” candidate in front of large viewing audience in ESPN. 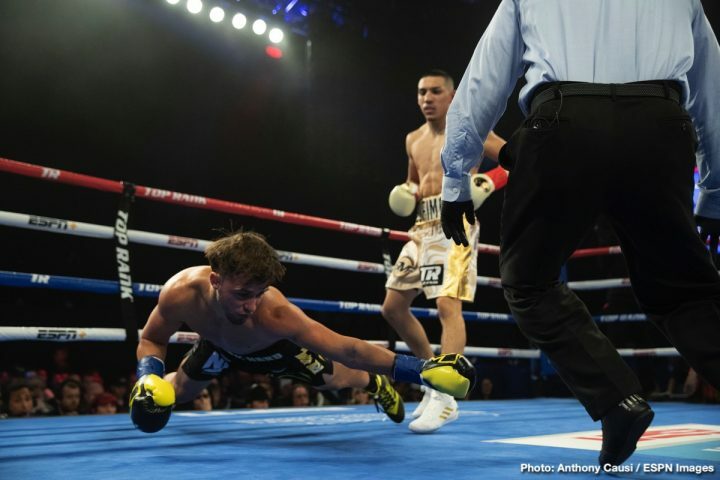 Top lightweight Teofimo Lopez scored an explosive 44-second knockout over Mason Menard this past Saturday night at The Hulu Theater at Madison Square Garden in a scheduled ten-round bout that was viewed by a massive audience on ESPN. Lopez landed a crushing right hand that had Menard plummeting face-first on to the cnavas, in what was the opening televised bout on the Vasilly Lomachenko – Jose Pedraza lightweight unification card. Lopez is now the NABA, NABF and USBA Lightweight champion. With the win, Lopez pushed his perfect mark to 11-0 with nine knockouts, and now he feels he is ready for anybody in the lightweight division. “I knew he was a tough fighter. I knew he could fight,” Lopez said. “I wanted to test him, and I took a chance early in the fight. I know he trained hard, and he didn’t want it to go that way. But this is ‘The Takeover.’ ‘The Takeover’ has begun. This past Friday night at the 2300 Arena in Philadelphia, undefeated super middleweight Kalvin “Hot Sauce” Henderson announced himself to the super middleweight elite by stopping hometown favorite Brandon Robinson in round seven of a scheduled 10-round bout that headlined a King’s Promotions card. Henderson diversified up his attack between boxing and mixing it up on the inside that not only opened cuts over both eyes, but closed the left eye of Robinson to completely shut. Henderson registered a knockdown in round round five, and then knocked Robinson to the canvas twice in round seven, before the fight was halted at 2:08.